The Department of Energy (DOE) on March 22 announced it will provide over $9 million and work with local public and private organizations to carry out 24 clean energy and efficiency projects in American Indian and Native Alaskan communities. In addition to reducing greenhouse gas (GHG) emissions, the community clean energy projects will boost local economies and tax revenues, as well as offer residents green jobs, education, training and career prospects. With the federal funding in hand, project partners anticipate raising an additional $16 million in investment capital to see the community clean energy projects through to fruition, DOE highlights in a press release. The new funding highlights federal government efforts to work with Native Americans to achieve local and national climate, low-carbon energy and sustainable development goals. Providing local leaders, residents and businesses access to federal resources, such as the DOE’s network of national energy labs, is a core element of the government’s approach. “The Energy Department is committed to maximizing the development and deployment of energy solutions for the benefit of American Indians and Alaska Natives,” Christopher Deschene, director of DOE’s Office of Indian Energy Policy and Programs, was quoted. Native American and Alaskan Native lands make up less than 2 percent of U.S. land area, but they’re home to an estimated 5 percent of national renewable energy resources, DOE notes. The agency’s Office of Indian Energy Policy and Programs has invested over $50 million in nearly 200 tribal clean energy projects since 2002. The latest federal Native American and Alaskan Native clean energy funding announcements also highlight the Obama Administration’s efforts to broaden local community access to DOE national labs and other federal resources. Via its State, Local and Tribal program the National Renewable Energy Laboratory provides Native American tribal and Alaskan Native communities access to the latest in clean energy and energy efficiency science, engineering, socioeconomic analysis and project development methods and tools, as well as expertise, education and training that helps improve local economic prospects, quality of life and ecosystems health and integrity. Geospatial studies of Native American and Alaskan Native land areas have zeroed in on a range of locally available renewable energy resources, for instance. “There is a huge opportunity to partner with tribes to deliver clean technologies developed in the lab to the real world, and also provide feedback from the real world into the lab,” NREL program manager for State, Local, and Tribal programs Elizabeth Doris commented. The Office of Indian Energy’s Strategic Technical Assistance Response Team (START) Program illustrates the strategic, holistic approach the DOE and Office of Indian Energy are taking. An illustration: an NREL team has been working closely with Northern California’s Blue Lake Rancheria Tribe to help them realize a strategic new energy vision that includes zero net GHG emissions and 100% reliance on renewable energy resources throughout the community. Having instituted and begun efforts to realize its strategic new energy vision in 2008, the Blue Lake Rancheria Tribe in December 2014 was one of 16 U.S. communities selected as a 2015-2016 White House Climate Action Champion. NREL has since been working closely with the tribe to refine and realize its renewable energy and GHG emissions reduction plans so as to maximize community rewards and benefits. That has included a community communications plan that aims to reach out to and enlist the entire community as stakeholders of one form or another, as well as leverage NREL’s technical, scientific and economic planning and development resources. 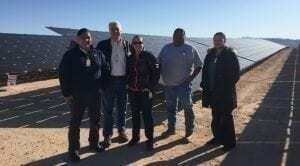 For instance, NREL’s team is working with the Office of Indian Energy and Blue Lake Rancheria leaders to review cyber-security for the tribe’s low-carbon community microgrid.